The Lark is a play written by French dramatist Jean Anouilh in 1953. 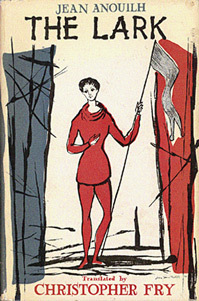 The play contains two parts about the trial and execution of Joan with flashbacks about the major events of her life so essentially the play covers Joan's entire life. The Lark opened on Broadway in 1955 with Julie Harris as Joan and Boris Karloff as Pierre Cauchon. These two stars reprised their roles in a 1957 television production for the Hallmark Hall of Fame series.